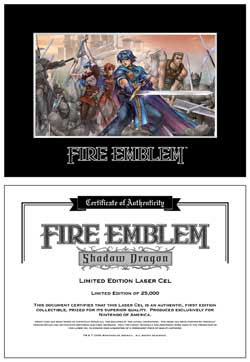 Nintendo of Canada have announced on their website that the much anticipated Fire Emblem: Shadow Dragon for DS will have a pre-order bonus for those who reserve their copy at EB Games. The bonus for pre-ordering is an authentic, limited edition laser cel from the game (pictured at right). "Laser Cels are a lithograph technology where the image is actually printed on industrial grade Mylar. Unlike traditional animation cels and paper; Mylar will not fade, chip, crack or deteriorate. Additionally, this synthetic is immune to heat, light and moisture." So basically indestructible. Maybe that's what they outfit riot cops with. If they don't, they sure as hell should.